Photograph from an album 'Views of Nepal', taken in ca. 1901 and part of the Curzon Collection. While the album, which contains architectural and topographical views taken in Nepal, is clearly credited as the work of Herzog & Higgins, the authorship is somewhat confused by the fact that a number of these images were later reproduced as the work of John Claude White. Prints 6, 8, 10, 20, 21, 22 and 29 appear in his article Nepal: little-known kingdom (The National Geographic Magazine, vol. 38, no.4, October 1920, pp.245-83), which states 'with photographs by the author'. The slightly ambiguous wording of this may indicate that some, but not all, of the photographs are by White. At the end of the Anglo-Nepal War (1814-1816), by means of the Treaty of Segauli imposed on the Gurkhas who ruled the Kathmandu Valley, Nepal had to accept its present eastern and western boundaries and admit an official British Resident in Kathmandu. 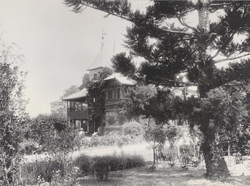 Here the view is from the garden looking towards the Residency, a two storey brick and timber building with a tower, in which the British Resident lived.